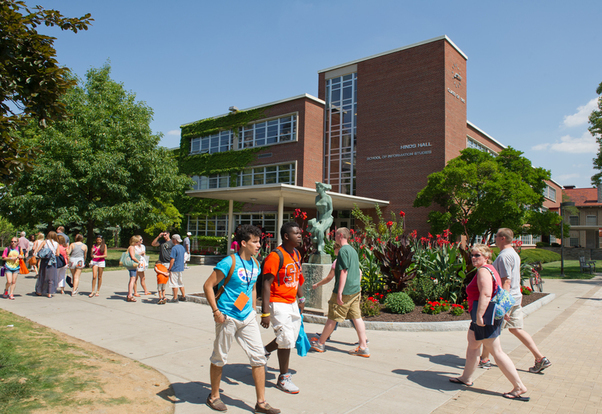 "Syracuse was named a top college for women pursuing online STEM degrees. This rating came from the SR Education Group, which evaluates colleges and universities online degree programs based on factors such as academic support and cost" inform Julia Murray, Contributing Writer. The School of Information Studies at Syracuse University recruits girls and young women to get them acquainted in STEM programs. Syracuse University was recently named a top college for women pursuing online degrees in science, technology, engineering and math by the SR Education Group. SR Education Group researched and rated 285 schools across the nation and published a list of the 64 top performers. SU’s ranking was not directly stated, but it did not place within the top 15 schools, according to the ratings. SR Education Group evaluates college and university online degree programs based on factors such as academic support and cost. The group publishes its findings on the website OnlineU, and the ratings are placed into categories based on major as well as type — including Christian colleges, LGBTQ friendly, disability friendly, military friendly and women studying STEM. Representatives from SR Education Group could not be reached for comment on this article. “The reason they have lists like this out there is because women are historically underrepresented in STEM fields, just on like a societal level, so the college has really adopted this responsibility,” said Matt Wheeler, communications manager of SU’s College of Engineering and Computer Science. Both the College of Engineering and Computer Science and the School of Information Studies contribute to Syracuse’s top ranking, as the two schools continually look to recruit women into the field early. The College of Engineering targets girls at a middle school level, right about the time they might start to think they don’t belong in STEM fields, Wheeler said. The iSchool has similar recruitment techniques, but starts even younger. “We bring in young girls and try to make them comfortable in a college and IT setting,” said Victoria Williams, director of online education at the iSchool. Community outreach also contributes to recruitment of women to SU’s STEM programs. The iSchool’s foundation in online and distance learning was laid 25 years ago, Williams said. The College of Engineering and Computer Science, meanwhile, developed an online engineering program within the past year. Rick DiRubbo, director of online learning at the college, said the percentage of female students in the Martin J. Whitman School of Management’s online program was higher than anticipated when he was at Whitman. DiRubbo said it was due to the flexibility of the online format, which makes the program easier for mothers with young children to participate. He said he hopes to see the same percentages for women in the online engineering program. SU’s women recruitment isn’t only online. The university has recruited women students and faculty to STEM programs on campus throughout the past two decades. In 1996, SU professors started the Women in Science and Engineering program that increased efforts for recruitment and mentoring and initiated a campus-wide lecture series.